If the franchise must continue – they’ve promised two more films before the curtains come down – it would be wise to go back and remember why the first film, all the way back in 2001, was such an unexpected hit. It’s because it had a scrappy, underdog quality to it, and a sincere heart. Both of those things are missing in Fast & Furious 8. And no amount of explosions and chases, however impressive, can make up for heart. As the case is, we have ourselves a Charlize Theron as the digital whiz-kid ‘Cipher’. She is wicked, she is evil, she is stunning, and she rules this one, without even getting behind a wheel. What about the cars, you ask? Even as the films come fast and furious (eight in 16 years), there are fewer and fewer grounds left to break. This one, with Gary Gray at the helm for first time, skates on thin ice. Literally. Eight movies into ‘Fast and Furious’, one would think the testosterone-fueled concept of speeding cars that defy the laws of physics would begin to start losing steam. But Vin Diesel with Dwayne ‘The Rock’ Johnson, Jason Statham and crew manage to keep our eyes glued to the screen just for the sheer spectacle of complete mayhem that ensues.There’s much to enjoy when cars are flying around the screen, even if logic takes flight with them. Some of the sequences are absolutely preposterous, but make for such a dazzling display of destruction that allow you to appreciate the audacity of the filmmakers to even conjure them up! Traditional to big-budget films today, the plot leaves room for yet another outing, although at this point one wonders how much gas is left in the tank of this franchise. 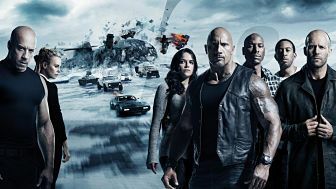 Fast and Furious 8, or The Fate of the Furious if we were to call it by its more inventive title, is not as deliriously over-the-top as 5, it isn’t as emotional as 7, and it isn’t as all around awesome as Tokyo Drift (which is, unconventionally, my favourite of the bunch). But none of this matters. Because in it, Vin Diesel races a nuclear missile. It is, however, the strangest, darkest, and the most deviant film in the series. A franchise that has dished out seven money spinners in the billions around the globe has evidently pre-sold its eighth even before commencement. So there we are probably on one of the first shows of ‘Fast 8’ on the globe lazily awaiting the familiar but F. Gary Gray ups the ante on the action front springing more than a few surprises and you surely get more than your money’s worth. The film has plenty of loop holes and it has more to do with the script.Despite its flaws, film will entertain you at best. The film delivers what fans expect from the franchise and that is over the top, loud mindless action and fun. Go in for Dwayne Johnson, Jason Statham and Tyrese Gibson’s scene stealer act. Watch it! Now that Dom (Vin Diesel) and Letty (Michelle Rodriguez) are on their honeymoon, Brian and Mia have retired from the game, and the rest of the crew has been exonerated, the globetrotting team has found a semblance of a normal life. But when a mysterious woman seduces Dom back into a world of crime that he can’t seem to escape, the crew will face trials that will test them as never before.